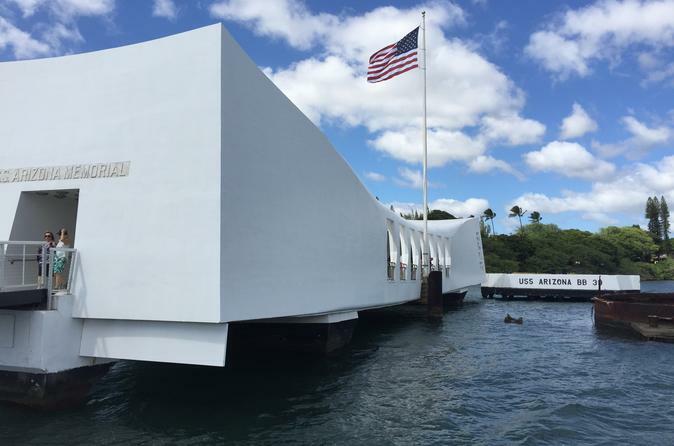 This Deluxe Pearl Harbor tour includes visits to the USS Arizona Memorial, the USS Missouri, the USS Bowfin, the Pacific Aviation Museum and a *complimentary short drive through Honolulu City tour. All these exciting sites and structures in one Royal Hawaiian Limousine package. RHL, the leader in VIP luxury tours, offers you the chance to visit Pearl Harbor in style and comfort. Avoid the hassle of traveling in a large group and reward yourself as you travel with your family or friends on our executive level small group chauffeur service tour. Visits to the USS Arizona Memorial, the USS Missouri, the USS Bowfin, the Pacific Aviation Museum and a *complimentary short drive through Honolulu City tour with RHL, the leader in VIP luxury tours to visit Pearl Harbor in style and comfort. Avoid the hassle of traveling in a large group and reward yourself as you travel with your family or friends on our executive level small group chauffeur service tour. Rediscover the past with this executive level small group Pearl Harbor tour. Gain insight into the World War II Japanese attack and pay respect to those service members who died on December 7, 1941. Visit museums and monuments that will explain the real events that transpired. After touring the USS Arizona Memorial, the USS Missouri, the USS Bowfin, and the Pacific Aviation Museum, we will take you on a ride to Downtown Honolulu and let you see some of the other historic places in the city. These include the famous Iolani Palace and the statue of King Kamehameha.